oh this is soooo pretty! awesome job on the colors! Thanks for joining us at Little Tangles! I love this! So pretty, elegant and stylish. Soooo pretty! Love the soft colours and sponging - how about One Layer Wednesday (Free for all? ), too! Thanks for joining us at Muse! oh Shirley...love the freshness and crisp feel of your card..so pretty. So happy you could play along with the OLW this week. A beautiful one-layer card. I love the soft colours and the added little sparkle! 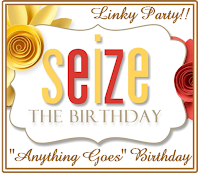 Thanks so much for joining us at Seize the Birthday! Shirley, I love your color combination. Thanks for playing along with this week's OLW challenge. Great combination of challenges! The sponging of the colours is just perfect! Beautiful card! I love the soft look of it. I'll be looking forward to seeing pictures of your craft room once it's complete!! I hope you will join us again for our next challenge on Thursday! So pretty. Love how you did the one layer card. Thanks for sharing with us at Seize the Birthday. This is gorgeous! So soft and feminine! :) Thanks for playing along over at the Simon Says Stamp Wednesday Challenge Blog! Beautiful card, I love the layout and colors. Thanks for joining us this week at ATSM! So beautifully soft and pretty! Love the stitched borders....did you hand draw the stitcthes??? They are amazing! Oh Shirley! This card is so soft and beautiful! I just love what you created! Thank you so much for sharing it over at Little Tangles! Shirley - what a gorgeous color. I love the muted colors and the pastels. Thanks for playing along with us at Little Tangles. Amazing CAS card! I love the soft colors! So soft, delicate and beautiful. Great CAS card. Thanks for playing along with Seize the Birthday! I love the designs you create with this set! The colors are so soft and pretty....love the touch of shimmer too! Thanks for joining us at Little Tangles!